A few weeks ago, I had the opportunity to spend a few hours at Funspot in Laconia New Hampshire. More specifically, at the American Classic Arcade Museum which is on the upper floor. For those who have never been to Funspot, they have the most amazing collection of 1980’s arcade games and I had a blast playing Asteroids, Ms. Pac-Man, Space Invaders, and many others. This journey to Funspot was motivated by an event that happened earlier this year. My local historical society showed ‘King of Kong: A Fistful of Quarters’ presented by none other than the current world record holder at Donkey Kong, Robbie Lakeman. Robbie is a super nice person and it wasn’t long until arrangements were made to meet up a Funspot to play some games. Robbie ended up getting to Funspot about half an hour earlier than I did and had already started playing Donkey Kong. It didn’t take too long for him to get to level 22 where an overflow condition causes Mario to be killed. Robbie had made sure to save some lives, so he was able to demonstrate the kill screen three times. This was something that I had only seen in the movie and YouTube, so it was super cool to see it on a real machine. Brian Kuh, who now lives nearby Funspot and played a prominent role in ‘King of Kong’, also came over and played some games. I had a chance to sit down and talk with Brain and Robbie and they were both humble and happy to share their gaming experiences. Just before I left, Brain and Robbie teamed up to play the latest incarnation of Space Invaders. We all had a great time and I can’t wait to meet up again and play some more classic arcade games! Categories: 7800, Atari | Permalink. 2015 has been a crazy busy year for me, so I haven’t had much time to keep up with this blog. It looks like things are going to slow down a little, so I hope I can post at least every couple of weeks. When I decided to get back into gaming, I studied which system to buy and decided on the Atari 7800. It was backwards compatible with the 2600 and 7800 games had near arcade quality graphics. There was also a small, but active development community ensuring a steady supply of new games to come. I didn’t really think about it at the time, but I have many times since. Why was the 2600 the most popular Atari 8-bit game system? The 5200 was short lived, had a small game library (constantly expanding now as 8-bit computer titles are converted), and controllers that broke easily. The 7800 had a poor controller, but a 2600 controller could be used to play games that only require a single button and it really does have great graphics (for an 8-bit system). I could see why 5200 wasn’t the top Atari system, but why the 2600? Over 30 million Atari 2600 game systems were sold from 1977 to 1992 and over 500 games have been developed for the 2600. Let’s face it, anyone that grew up in the 80’s either had an Atari 2600 or knew someone who did. So many classic games have been ported to the 2600 such as Berzerk, Missile Command, Space Invaders as well as original games like Kaboom, Pitfall, and Yars Revenge. Combined with a still active homebrew community that cranks out several new games each year, the 2600 has continued to thrive. New circuit boards for carts and tools for development such as emulators and todays laptops and PC’s have allowed developers to do things that were not possible in the 80’s. One of the 2600’s most recent releases ‘Space Rocks’ uses the ARM CPU on the ‘Melody Board’ to run code written in C. The Atari CPU is used to ‘paint the screen’. This has allowed for near arcade quality (80’s) games to be developed for the 2600. The other thing that the 2600 has going for it is simplicity. 2600 controllers only have one button and the unit only has six switches. Most games are intuitive and can be played without even consulting the manual. At the same time, there are some fairly complicated games like Solaris that can keep you playing for hours! Categories: 2600, Atari, System Reviews | Tags: 2600, 8-bit, Atari, Atari VCS 2600 5200 7800 | Permalink. Last year, I picked up an Atari 2600, two joysticks, a set of paddles, and ten games at a local thrift store. The console worked perfectly, but the joysticks were iffy and the paddles all jittery. I had never re-built an Atari controller before, but I am pretty handy with a soldering iron, so I thought I would try rebuilding these joysticks and paddles myself. The two joysticks were in good physical condition, so I used one of those damp, anti-bacterial cleaning cloths to get all of the dirt and dust off of the outside. To open up an Atari joystick, just unloosen four screws on the bottom of the joystick and the top will separate from the bottom. Be careful as fire button and spring will come loose and one of my springs went missing. There are a few dealers that still have original Atari CX40 joystick circuit boards for sale, but I opted for a re-build kit from Best Electronics. Best includes a new joystick handle and a new circuit board, with gold contacts, that is an exact fit for the original Atari circuit board. I had already turned my soldering iron on before I realized that no soldering would be needed as the Atari wiring harness is connected via slide clips. I carefully removed the wires from the original board and installed them on the new Best gold board. The Best gold board includes markings that indicate which wire should be connected to each contact. I then carefully re-assembled the joystick and tested it. This actually took me a couple of iterations as I didn’t have the spring lined up correctly and fire button wasn’t working. Also, since I lost a fire button spring, I had imagineer one from a ball point pen spring. Thus, I highly recommend ordering a couple of those from Best when you order the rebuild kits. Once I had the springs properly aligned, the joysticks worked perfectly and are now better than new! The Atari CX-30 paddles are infamous for becoming ‘jittery’, after many hours of use. Some people have had success using contact cleaner to solve this problem, but most of the time the potentiometers are just worn out. As far as I know, it is almost impossible to find original replacement potentiometers for Atari paddles. Thankfully, Best Electronics has been able to locate a source of replacement ‘super pots’ for Atari paddles that are actually better quality and a perfect fit. To replace the pots in a set of CX30 paddles is pretty straight forward. I removed the two screws from the back of the case to separate the case halves. I then loosened the nut that holds the pot in place and carefully removed it. I used my soldering iron to unsolder the two wires from the existing pot and, then soldered them to the new super pot. Using the new nut that comes with the super pot, I re-installed it into the case and re-assembled the case. I repeated this process for the other paddle in the CX30 set. Once they were both back together, I tested them and they worked flawlessly, but one of the paddles had a rattle. I took it back apart and realized that the plastic housing had cracked around one of the screw holes. Not wanting to wait to order a replacement case, I used a little silicone adhesive and shored up the post with a wire tie. Problem solved, rattle gone! The re-built paddles are smooth and jitter free! One of my CX24 joysticks for my Atari 7800 wasn’t working very well, so I had also ordered a replacement circuit board from Best. It was a simple effort to swap this board, in my failing controller, and restore it to full health. Fortunately, it is fairly easy to give new life to old Atari controllers. There is more than one on-line Atari dealer that have repair parts for Atari joysticks and paddles, but Best Electronics seems to have the most complete selection. Their ‘gold’ joystick circuit boards and ‘super pots’ are easy to install and will give your controllers new life. Don’t continue to settle for a failing controller and don’t think that your only option is to buy new ones…get some replacement parts and re-build them yourself! Categories: 2600, 7800, Atari | Tags: 2600, 7800, Atari, Joystick, paddles, VCS | Permalink. Battlezone-Atari made a great version of this game for the 2600 and Activision developed a similar game (Robot Tank) for the 2600 as well. It would have been awesome to see a simulated vector graphics version developed for the 7800, but a version in the style of either of the 2600 games would have been fine as well. Defender-Atari made awesome versions of this game for both the 2600 and the 5200. In fact, the also made Stargate (or Defender II) for the 2600 as well. Bob DeCrescenzo hacked Defender II to make an almost perfect version of Defender for the 2600 (Defender Arcade) and the Atari 5200 version is widely respected as one of the best games made for the Super System. Seriously Atari…what were you thinking…where is Defender for the 7800? At least we can play Bob’s great 2600 game on our 7800’s! Galaxian-Atari made Galaga for the 7800, so I guess they figured that they didn’t need to make Galaxian as well. The 2600 version has been hacked and updated into a pretty good game and we can play that version, but it would have been nice to have an official Galaxian for the 7800. Kangaroo-Atari developed great versions of Kangaroo for both the 2600 and the 5200. In fact, the 5200 version is almost arcade perfect. Kangaroo is clearly inspired by Donkey Kong and, maybe since Atari was able to produce Donkey Kong for the 7800, they felt that they didn’t need to develop Kangaroo as well? Too bad as the 7800 would rock this game! Millipede-the 7800 version of Centipede is pretty awesome and is a blast to play in the two player cooperative mode. Millipede is an Atari classic and it is surprising that they never developed a version for the Pro System. The 7800 was designed to be able to display up to one hundred objects without flicker…Millipede would have been a showcase game for the Pro System. Missile Command– Given that General Computer Corporation developed the 7800 and they got their start as a company by making upgrade kits for the Missile Command Arcade units, this is one of the most stunning omissions from the 7800 library. You can certainly play the 2600 version on your 7800, but imagine updated graphics and all three missile bases! Pitfall-Activision developed two games for the 7800 (Double Dragon & Rampage), but never updated their 2600 classic. It would be cool to see what could have been done with the 7800’s improved graphic capabilities. David Crane, we know you are still out there…show us 7800 fans some love…return to your roots and give us an updated version of Pitfall for the Pro System! Star Raiders-this was an awesome game on both the 2600 and 5200 consoles. Atari, already had the keypad for the 2600 version which could have been reused for a 7800 version. A 7800 version of this game would be a blast and could have been a big seller for Atari. Tempest-it took thirty years, but Tempest was finally completed for the 5200. One homebrew developer started on a 7800 version, but never completed it. With the ability to add Pokey chips to the 7800 cartridges, it should have been possible to develop a near arcade perfect port for the Pro System! Zaxxon-back in the day, I was jealous of Colecovision owners as they had great home versions of both Donkey Kong and Zaxxon. Atari develop a similar game for the 7800, called Desert Falcon, that is actually pretty good, but not Zaxxon. Zaxxon is a true ‘80’s arcade classic that should have found its way to the Pro System! One game that I would have included in my top ten would have been Frogger…who played video games in the ‘80’s and didn’t play Frogger? Up until now, 7800 owners have had to be content playing the Parker Brothers 2600 version of the game. 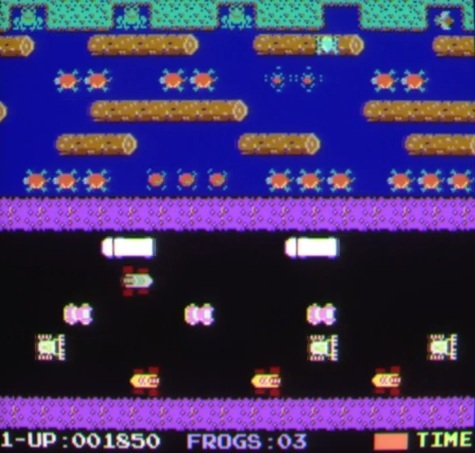 Fortunately, a near arcade perfect version of Frogger (called Froggie) has recently been developed for the 7800 and should be released later this year. As for the rest of my list…any of you 7800 homebrew developers reading my blog? Categories: 7800, Atari | Tags: 7800, Atari, Homebrew | Permalink.